Today at the Journal, we've got our latest installment of Retail Therapy, this time with Jenn Haines. There's a lot of things I agree with Jenn about, but the main one this week is that I also think that Barrier comic from Marcos Martin is gonna rule. We have a very specific mandate: exceptional products and service for everyone. This means we are very family-focused, and welcoming of people of all ages, genders, and abilities. As a result, there are publishers, such as Zenescope and Avatar, that are special order only. We have a huge commitment to kids books, and I'll pretty much try any graphic novel that's intended for kids. And we are focused on providing a wide range of books to meet the tastes of our very diverse customer base. Beyond that, we really just look at our customers' buying habits and see where their interests lie. For example, we don't carry collections of older material or any new hardcovers, as they've traditionally gathered dust. Instead, we want to give customers the chance to find things they won't usually find elsewhere. We order a lot from smaller publishers and self-published material direct from creators, as a result. Sometimes, a popular creator, or a really great publishing mandate, like that of Lion Forge, will get us to take risks on new series. And sometimes, it's just that I like the look of something. However, I've learned the hard way over the years that what I like is not what sells! But of course, we've also got that TCJ Review for you: today, it's Patrick Kyle's Everywhere Disappeared, and it's being covered by Cartoonist Diary alum Tom McHenry. Yes. Yes indeed. The more of these blog posts of old super-hero comics with rad covers I find, the better it makes me feel about the future, because if there is a future, i'm going to buy some of these old super-hero comics, and I'm going to make my own blog posts about them. Coincidentally, the one I just read two days ago was one the Punisher comic above, whose cover would have fit perfectly with the linked article's theme. And finally, if you haven't read Peggy Burns on Love That Bunch, the Love That Bunch tour, and the cartoonist behind those comics, Aline Kominsky-Crumb, it's high time you remedy that. I'd call it image heavy, but there's a lot of weight in those sentences as well. Is it positive day? I guess it's positive day. I became part of the problem, and descended on the going out of business sale at the store I'd never much shopped to grab up the discounted comics that had found their level in the market here. Namely: inventory items that contributed not to the store that carried them’s year-plus in operation, but to its ultimate failure. In most mediums, that status would speak to a majority of these products’ quality, mark them out as simply inferior. But American comics is home to the creative world’s most chauvinistic fan community and most predatory distribution monopoly, not to mention a greater percentage of product whose motivating factor for existence is corporate greed than just about any other. In American comics, a going out of business sale is as likely a place, percentage wise, to find something good to read as a thriving concern is. I spent just under 30 bucks and got these six books to show for it, each of them showing off something worth a reader's while: unique modes of artistic expression, or legitimate innovation, or a lesson about the form's history, or a look at paths left untaken, or a hilarious level of badness that provides its own justification, or simple brilliance. And then Katie Skelly arrives too, with a review of Ryan Heshka's Mean Girls Club. —News. First Second's Gina Gagliano is moving to Random House to direct a new imprint of children's graphic novels. —Interviews & Profiles. Hillary Brown talks to Vera Brosgol about her new graphic novel, Be Prepared. Paste: Can you talk a little bit about the process of creating the visuals for this book? You went back to the campsite, right? Brosgol: Haha, I sure did. I wanted to get the details as specific as possible and my memory is garbage, so I stalked the camp’s Facebook page till there was an open house and flew across the country for it (and to visit my mom, hi Mom!). I thought it was kind of an alumni event but it turned out to just be parents visiting their camper kids. Oh well, I guess I’m old enough to pass for a mom? I snuck around taking pictures and sketching, and a counselor was curious about my drawings. After I explained the project to her she was awesome enough to email with me and answer my boring questions about camp rank, insignia, routine, etc. I owe her big. I could’ve made everything up but I think you can taste the reality baked in somehow. And nobody could ever make up that horrible outhouse. The most recent guest on Virtual Memories is Roz Chast, and the most recent on RiYL is Adrian Tomine. —Commentary. Douglas Wolk recently started a new series of posts on artists inspired by Jim Steranko. It's time for a new week of TCJ, people. What better way to start it off than a meaty interview with influential cartoonist John Porcellino? Wait--how about if this was only the first part of said meaty interview? It's time to get your long read pants on, pal. John and Rob have a lot to talk about! Your style underwent a dramatic change from the beginning of your career to your more mature style. What led you to decide to strip down your individual images? It was never a conscious choice or decision, it was just how things organically developed. That was something that I emphasized to myself from the beginning of King-Cat -- I wanted it to be what it wanted to be. I didn't want to have a preconceived notion of what my comics, my zine, should be. I tried to get out of the way of my creativity, to allow what was inside to come out unobstructed. On the crowdfunding front, Women Write About Comics is prepping to move their site to a hosting service that can handle their expanding size and popularity and they've issued a call for financial help to assist in the transition. 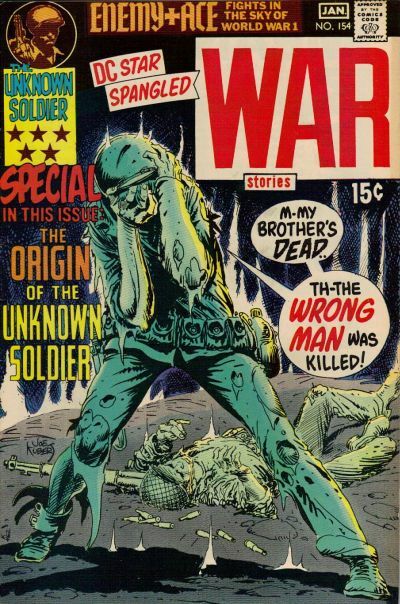 While my favorite Joe Kubert comic is currently an issue of Punisher where he inked his son so well I achieved self-actualization, it's going to be very difficult to keep maintaining that claim now that Diversions of the Groovy Kind has rounded up of a bunch of his Unknown Soldier covers. Look at the way the Soldier presses his right hand into his face, the bend at the wrist, the delicate balance between depicting the pressure of his fingers to his face and allowing for the it to appear like the hand is about to get yanked away to reveal what was to be hidden by bandages. I've never wanted to be a cartoonist, but goddamn, if I could draw like that! While I should probably do some more research before proclaiming my whole hearted support for the group of Columbia students demanind that they get a tuition refund for their Visual Arts MFA program, I'm just going to go ahead and nod my head vigorously until somebody tells me otherwise. Sometimes life is a meritocracy, but that's rarely true in comics, where champions die blind & impoverished while greedy liars die rich and unpunished. So let me follow that terrible prelude by recommending that we celebrate Ruben Bolling, who won the 2018 Robert F. Kennedy Book & Journalism in the Cartoon category for Tom the Dancing Bug, a comic that has maintained a consistent level of ferocious quality that's really remarkable. Today on the site, the irreplaceable Ryan Holmberg returns with a new installment of his What Was Alternative Manga? column. This time, he publishes a newly translated 1969 interview between manga legend Tsuge Tadao and an editor from Garo. TS: The first story you published in Garo was “Up on the hill, Vincent van Gogh...” (“Oka no ue de, Vincento van Gohho,” December 1968). Was that something you had wanted to draw from before? TS: Was the prose version the same as how the manga turned out? TT: No, they were totally different. TS: For you, is there any difference in writing something as prose versus drawing it as a comic? TS: When I first saw that work [Takano was managing editor at Garo at the time], I thought about how much it read like a novel. It also felt like someone’s “final work,” and I remember that making me shudder. Like, once an artist goes this far, what else is there left for him to do? Even if he had other stories in him, could he draw them? TT: That story was something I was happy working on a little at a time. If Garo had rejected it, that would have been fine with me too. I had a full-time job at a company, so I worked on it slowly after coming home from work. That sure was a strange way of working. TT: A friend of mine who is a schoolteacher read that story and said, “Damn, that’s bleak.” I took it as a compliment. Of course, we also have Day Five of the Cartoonist's Diary of Fiona Smyth. She rounds out the week with a trip to two-floor Yayoi Kusama exhibition. Finally, we have Tegan O'Neil's review of the expanded reprint of Craig Thompson's Carnet de Voyage. As a genre travel narratives are both necessary and problematic in equal measure. Necessary because human beings need to understand one another, and anything that bridges those gaps is worthy of celebration. Problematic because there are so many ways to communicate difference in ways that hinder rather than enable understanding. For centuries books very similar to Thompson’s Carnet were able to define the parameters of the non-English speaking world more or less arbitrarily based on poor and often malicious transliterations of cultural practices in one part of the world to another part of the world. Thompson is aware of this, to the extent that thinking through these problems also became central to Habibi, the book that followed Carnet and inherited from the earlier volume Thompson’s interest in North African culture and design. There’s a Catch-22 here and it’s central to the book and most books like it: young men who go overseas to gain a bit of maturity from a more worldly perspective sometimes learn that real maturity only begins with the insight that other peoples’ countries weren’t created to be backdrops for the musings of sensitive young men. —Reviews & Commentary. The Paris Review excerpts Ed Park's introduction to a new collection of the comics of Chris Reynolds. Eight decades after the RMS Mauretania’s maiden voyage, Chris Reynolds, a Welsh-born artist in his mid twenties, embarked on what would be his life’s work, a beguiling series of loosely connected stories that he called Mauretania Comics. The work had nothing to do with that remote place or with seafaring vessels of yore, and the name was just one of its many elusive mysteries. The stories were and are easy to consume but tantalizingly difficult to characterize. Droll dialogue gives way to utterly melancholy voiceover; locales like “The Lighted Cities” and “Mouth City” are mapped on the same imaginative terrain as some version of England, one where a blasted figure out of J. G. Ballard might run across Russell Hoban’s Riddley Walker. Monitor, Mauretania’s signature character, always dons a helmet with a striplike visor masking his eyes. (Today he wouldn’t look so out of place: it resembles nothing so much as a virtual-reality headpiece.) The architecture alone is worth the trip: lipstick-shaped temples of music, a house like a geodesic dome crossed with a web made by a spider on acid. At The Smart Set, Chris Mautner writes about the work of Yvan Alagbé. These two men are Alain and Mario, respectively, the two central figures in the book’s title story. This pair of images might suggest that within lies an overly simplistic story of racial animus, but “Yellow Negroes” (or “Negres Jaunes” in French) is far more complex and haunting than that fleeting impression would suggest. The story has long been regarded as a masterwork in Europe, one of the seminal French comics of the 1990s. Now it’s available in English for the first time, and, despite the considerable span of years and cultures, it — along with the other stories in this slim volume — remains as trenchant and relevant as when it was first published. Kominsky-Crumb recently encountered one of her early inspirations, the veteran Jewish standup comedian Jackie Mason, on a Miami street. Starstruck, she summoned up the courage to approach him and express her appreciation of his career: “Jackie Mason, I can't believe you're just here standing here on Lincoln Road!” Mason's reply: “What, I should be lying down? Finally, the Comics Alternative podcast talks to Hazel Newlevant. And to celebrate the reunion of Ryan Heshka and the color pink, Nobrow has provided TCJ readers with an excerpt from their upcoming Mean Girls Club: Pink Dawn. Shield your eyes in such a way that you can still see with them, friend. But it wouldn't be the first week of May if we weren't talking about Fiona Smyth, who is here today with Day Four of her cartooning tour of duty. Today, she's not about to let illness stand in the way of her creativity. Elsewhere, a teaser trailer was posted for one of the most anticipated graphic novels of all time, and if you think i'm being hyperbolic for effect, i'm not. I do think it's weird they let Kevin teach college classes when he doesn't know what "teaser trailer" means. And recently, cartoonist Luke Healy stopped by Pipedream Comics to talk about his upcoming graphic novel with Avery Hill. In preparation for Michel Fiffe's upcoming run on Bloodstrike, the cartoonist has been generous enough to prepare this history lesson on the franchise (sure!) for those of us who have never had the fortune to read an issue, to busy we were with tea in china cups, boat shirts with horizontal stripes, and other forms of listlessness. This picture is a fine representative of the narrative that awaits you. Today on the site, the excellent cartoonist and comics scholar Mark Newgarden interviews Justin Duerr, the man who, after becoming obsessed with the work of Herbert Crowley, the mysterious artist and creator of The Wiggle-Much, put together a giant book about him. I never went into any of this with the expectation that there would be a book. I just wanted to connect some dots of history that seemed to be pleading to be connected. I honestly began to feel as if these spirits of the past were driving me on, compelling me to do this. I had several hair-raisingly uncanny experiences during the course of it all. Then we have Day Three of Fiona Smyth's Cartoonist's Diary. This installment involves teaching comics and traveling to Pittsburgh. And finally, Robert Kirby is here with a review of the reprinted, expanded Aline Kominsky-Crumb anthology, Love That Bunch. —Interviews & Podcasts. The most recent guest on the Study Group podcast is Michael Kupperman, and the most recent guest on Inkstuds is Chris Reynolds. —Reviews & Commentary. The British cartoonist Martin Rowson explains his history with Marxism, and the thought process behind his new adaptation of The Communist Manifesto. The whole thing came instantly into my head. I clearly envisioned the manifesto as a kind of rolling tsunami, made up in equal parts of blood-and-iron industrialised steampunk, apocalyptic John Martin and mounting fury that builds up to a climax at the end of Section One: Bourgeois and Proletarians, before breaking on the beach of History and turning into straightforward standup comedy. It’s leavened throughout with private gags, personal score-settling and the kind of Rabelaisian filthiness Marx would have enjoyed, I hope that is what I’ve achieved. At The New Republic, former TCJ all-star Jeet Heer talks comics and movies with Josephine Livingstone and Alex Shephard. Today at the Journal, we're pleased to share an interview with Hope Larson, whose latest graphic novel with First Second sees release this week. Hope's career has seen her showing up with quite a few different credits under her belt--and it sounds like that was the plan all along. Do you think about your career in quite a calculated way? I think I’m pretty calculating. But that said, I’m calculating so I can continue doing this. I want to be able to keep making books, and part of that is you have to achieve a certain level of success and financial stability. I do books that are passion project books, and I do books that are paycheck books, and hopefully I can learn something from them along the way. Batgirl would be a good example. I really needed a job when I got that one. Like, I needed it to survive. But I also thought: I’ll be able to play in a different sandbox for a change, and play with different characters, and it is totally unlike anything I’ve done before. I’d been wanting to move into more of an action-y direction anyway in some of my work. And it really was awesome. It’s what I hoped it would be. We've also got the newest installment in Fiona Smyth's Cartoonist Diary. Today's entry features a walk-on appearance by Annie Koyama, who Fiona depicts Michael Zulli style. And that's not all. Today's Review sees Matt Seneca taking a look at the latest installment in Jim Rugg & Brian Maruca's long running series of Street Angel stories, Street Angel Goes To Juvie. Rare indeed is the still-relevant creator that can lay claim to having been a darling of Wizard magazine; rarer yet is to see a title that was one of the five or six non-mainstream comics those dudes felt comfortable recommending still flourishing. But flourish Street Angel has, for coming up on fifteen years - long enough for the book to elbow its way into a place in the new kind of mainstream that's emerged in response to Act II of Marvel and DC's ongoing commercial and creative collapse. Elsewhere, Alex Dueben has an excellent interview up at Smash Pages with Eleanor Davis that I happened to miss when it first dropped, so maybe you did too. Remedy that, or read it again. That's not the only interview I liked reading--I was also pretty into this overview conversation with Jim Rugg about Street Angel. I'm also jealous of whoever does their photography, or at least, whoever covers their photography budget. And finally, one of the most tired claims that a certain kind of comics writer (but rarely an artist) spent a good portion of the mid 00's making was that "movies couldn't pull off what comics could do", and the reason it got so tired was because the follow up examples were always things like "a Bryan Hitch spaceship", which movies actually do a very fine job of, and have since at least the 1970's. So while my eyes involuntarily rolled in nostalgia when Matt Zoller Seitz dusted that old chestnut off, he then went to deliver a pretty astute observation about how comics actually can do movies better in his review of the latest super-hero picture. Today on the site, a brand new Cartoonist's Diary begins, this time from Fiona Smyth, and on day one, it concerns online chess, back pain, and art shows. We also have Greg Hunter's review of Michael Kupperman's All the Answers, a surprisingly straight graphic memoir from a cartoonist who specializes in absurdist comedy. “‘I think of you like a son,’” Adams remembers saying, “‘and I’m gonna lose you.’” Now he believes Miller “will mend”. The Los Angeles Review of Books interviews John Porcellino. By the time I started King-Cat I had a pretty clear idea of the way I wanted to approach things. Coming from punk rock, I was interested in paring things down, leaving them unpolished, looking for the essence of things, instead of getting bogged down in the superficial. So I wanted my comics to reflect that. They were very spontaneous. It was interesting to me to throw ink down on paper and see what came out. Even the vagaries of using cheap photocopiers, the kind of distortion and unpredictability of it — it was all thrilling to me! Putting a page of comics on the glass and seeing what came out of the machine. In the early days I didn’t edit things or worry about them or plan them too much. I’d make a comic and print it and then wonder why sometimes I was able to achieve what I’d set out to do and why sometimes I’d failed. But I wasn’t interested in making “perfect” comics. I figured there would always be a next one, and hopefully that next one would work a little better than the last. —Reviews & Commentary. For her first New York Times column, Hillary Chute reviews new books by Eleanor Davis and Porcellino. Just like Magritte’s famous caption, “Ceci n’est pas une pipe,” Davis underlines in a fond, joking way how the representation of an image can dominate the image itself. The “blue” category also offers what looks to be a small toy pig (what other kind of pig would be blue?) standing near an amorphous monochrome blob. Davis wordlessly switches between images that are realistic and those that are abstract, a move that endows the book with an appealing tension from the outset, as well as with a kind of gag reel of effects that unfurls alongside nuggets of wisdom about art and audience. She shifts in this way from the didactic to the fabulist — and at her best moments melds the two. Caleb Orecchio writes about how cartoonists such as Connor Willumsen and Chris Ware use setting in their comics. Every character, object, and environment is paired down to bare essentials visually. Everything is a symbol. There is very little confusion in a Chris Ware comic despite its intricacies due to the use of the symbolic rendering of the environment therein. When a character walks in and out various rooms, we can easily follow them. In fact, I feel I have actual awareness that is lacking in other comics because Ware often will show the reader the sum of the parts before exploring the individual pieces. —Misc. The cartoonist Milton Knight has been evicted, and has various health issues, and is asking for help.